It looks like Andy Woodman will be joining up once again with Alan Pardew at Crystal Palace, if terms can be agreed to pay compensation to Newcastle for Woodman, who still has five years left on his eight year deal at Newcastle. That would mean that all the coaches who were Alan Pardew’s first team coaches at Newcastle – John Carver, Steve Stone and Andy – will all have left the club. John Carver and Steve Stone were fired a day before Steve McClaren was announced as the new head coach in June. That was after a disastrous five months in charge of Newcastle, when we were almost relegated on the final day of the season, after being in a comfortable 9th place when they took over the club at the end of last year. There are a number of goalkeeping coaches being linked with Newcastle to replace Woodman, with former Newcastle coach Simon Smith in the reckoning. Smith became the first-team goalkeeping coach at Newcastle initially working under Ruud Gullit in the summer of 1999, and then was coach for Sir Bobby Robson, after Ruud was sacked in late August of 1999 after only a year at the club. That came after Newcastle were beaten 2-1 at home by Sunderland, a game in which Gullit had dropped Alan Shearer. 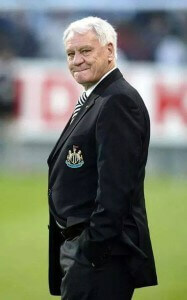 In the next home game, which was Bobby Robson’s first as Newcastle manager, we hammered Sheffield Wednesday 8-0 (5-0 up at half time), and Alan Shearer scored five goals – still a Premier League record. Steve McClaren’s goalkeeping coach at Derby County – Eric Steele – is also said to be in the frame. However, earlier this month Steele was hired by the Football Association to coach goalkeepers across their junior teams, so it seems unlikely Eric will be coming. Before he took the job at the FA, Eric was heavily favored to replace Woodman at Newcastle, but it seems a compensation deal between the two clubs could not be worked out until now. Iv been saying for days the rumors have dried up. Baring a few youth signings, I think we are pretty much done. No great loss. Let him join the Pearly King. I think all the keepers on his watch here could have had their performances improved with better coaching. You can’t do much about a keeper’s reflexes etc. but you certainly can when it comes to things like positioning and distribution. I thought Eric steele was no longer in the frame. On another note. We have to play 433 against Southampton. We need to keep Southampton full backs up the pitch. We need pace and creativity to get the best out of mitrovic. Use cisse as super sub. He’s better as an impact player anyway. Mrs Woodman will be a very happy woman. She gets to go to London, while son Freddie will only be an hours drive away in Crawley! In my eyes watching the TOON our keepers have went back. Like to see a coach that works on our keepers commanding the six yard box, coming for corners, distributing the – throwing passing out instead of hoofing it. I think the club may be moving away from the French connection. Macca mentioned a leadership group that seemed to be the frenchies in the main. I can visualise Gouffran Riviere Obertan Cabella and even Sissoko going down the road , not all immediately but over the next few windows , in which case I don’t think we are finished this window. Colo and Taylor @ CB I’m assuming wor Al? Jib – continuing from last thread as one has to on here – how do you see it then? Do you think we have the defenders in our squad to keep out the top teams for a season? For that matter do you think signing four players – none with PL experience – is a reasonable haul for a team that scraped survival and hasn’t strengthened in three windows? Woo hoo, just another charmless oaf like carver gone. You are correct, I read yesterday that Eric Steele had turned us down. Do you seriously believe we are not finished in this window? Do you mean players going out, coming in or both?? Can you see Ashley spending another 20+ million? Apparently he is on the short list, I read that yesterday too. i think a lot of people would like a front 3 of perez, mitro and aarons. not sure sm is brave enough to do it though. At the back wouldn’t mind seeing Colo as sweeper behind MBemba and Lascelles in a 343. He may have been a poor coach but so were most of the players he was coaching. Steve Harper is not ready yet, he tweeted yesterday that he is not finished playing yet, although he has just completed his A Licence. I would love it if we played that front 3! Pav wrote in the Chron a couple of weeks ago he’d love to do the job but just now is not the right time. Be a very popular choice no doubt. don’t think we can knock the 3 quality signings we’ve made, all of whom have CL experience. most signings are foreign for all clubs these days given the stupid inflated english prices. Some will hit the ground running, others won’t. Same’s true of english players switching pl clubs. Rutiger, matip, n’kolou, abdennour, veltman, dragovic, dunk, none will have pl experience but I’d take them over saylor and willo any day. Do you not think we will have to hold on to the likes of Williamson, and Taylor, as we have to have a number of English, or home grown players in the squad? Rotonda@18 – have you watched Lascelles in the pre-season matches – he’s miles off being ready for the PL. Sorry I wasn’t being rude , I got involved chasing grey squirrels off of me bird table. In short I don’t think we are finished spending. Lascelles must have something about him, I am yet to see him play, but was he not invited to train with the England squad a few times last yr??? Agree completely. Should be groomed to take over the Bob Moncur role. Keep him well away from the training ground but respect his place in the NUFC scheme of things. Is that Pavel Srnicek you are referring to? Only way we’ll get another centre half is if Colombia plays and breaks down again on Saturday. krul who i really rated has dramatically gone backwards under woodman, elliot is nearly as fat as woodman and as for alnwick has anyone ever been so under prepared. KK you aways blame the players but getting shot of carver, stone and woodman is absolutely fantastic for the club to develop players. Those 3 aren’t even league 1 standard coaches. I know mate, we need some more English players in the development squad, then we can get rid of the dead wood. I think of the 25 man squad 8 have to be home grown, not 100% on that. I think Krul counts as home grown and he came through the academy. Someone will correct me if I got it wrong. Jamsey – yes that’s true, but he is obviously not up to PL speed yet from what I’ve seen (on TV) and been told. Thanks. Is he still living in the North East? He seems to have a huge affinity with the area!